Posted on September 29, 2013 by Ching under Date Ideas, Things to Do. Those who complain that there’s never anything to do in Wichita aren’t looking hard enough. 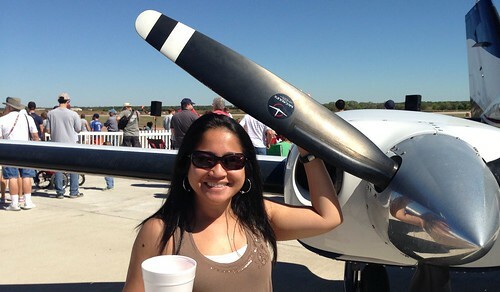 Brian and I had a fantastic time at the Wichita Flight Festival today. The Wichita Flight Festival is open to the public and doesn’t cost a thing. Unless you are hungry like we were. In that case be sure to bring cash for concessions. Bring your lawn chairs and enjoy the afternoon. I’m filing this under “cheap date ideas” and coming back next year. LOL. Posted on September 28, 2013 by Ching under Food and Drink, Life. I didn’t want to mope around the house after dropping Brian off at the airport so I ended up driving to Jersey’s to watch some friends play sand volleyball. The tournament was a fundraiser for the Sedgwick County Sheriff’s Office Leaders Achievers and Winners (LAW) Camp. 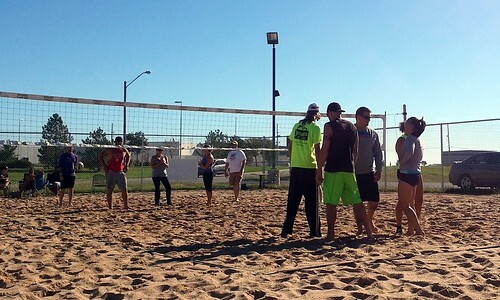 It looked like so much fun that I’m now trying to convince my coworkers to host a sand volleyball team building event. I mean, who doesn’t like playing volleyball? Anyway, I worked up an appetite watching Rachel, Michael, and Stephanie play so I found myself at mom and dad’s in Derby looking for food. They didn’t have anything so mom took Jenni and me to Hibachi Boy in Derby. Hibachi Boy serves food that you would typically find at fancier Benihana-type restaurants minus the performance and the high prices. If you need something to compare it to, it’s a lot like Emperor’s. Except I think that Hibachi Boy actually offers a better value because you get fried rice, noodles, hibachi veggies, and bean sprouts along with your choice of meat. As far as menus go, I also think that Hibachi Boy offers a much greater selection because they also serve Thai, Vietnamese, and sushi. I’m pretty sure that if it’s Asian, Hibachi Boy serves it. LOL. Places like Emperor’s and Hibachi Boy are a great alternative to Sumo or Sake (two of the most popular Benihana-type restaurants in Wichita) if you could care less about the performance and you don’t have that much time anyway. 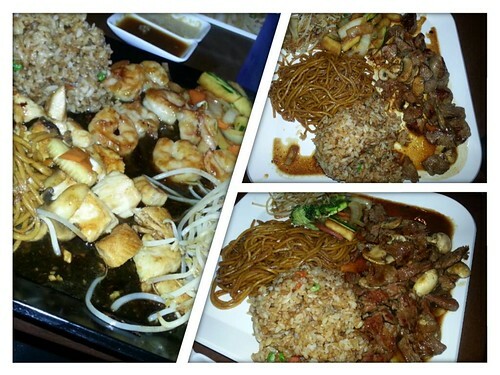 It’s a fast hibachi meal at a lower price. Once Brian gets over his “I don’t want to eat out anymore” phase, I’ll probably bring him to Hibachi Boy. I ended up hanging out at mom and dad’s after lunch. I figured it was better than hanging out alone at home. Jenni rented The Bling Ring so I ended up watching it with her. Did my homework and ended up staying for dinner. Mom made bok choy. We ended up visiting for a while and, before I knew it, it was almost eight o’clock. After twelve hours away from my own house it felt so good to home. It also helped that Brian and I thoroughly cleaned the house the day before so the house smelled fresh and clean when I returned. Sometimes time away from something makes you appreciate it even more. The same holds true for people. I was so happy to see Brian when I picked him up from the airport this afternoon. Welcome home, baby! 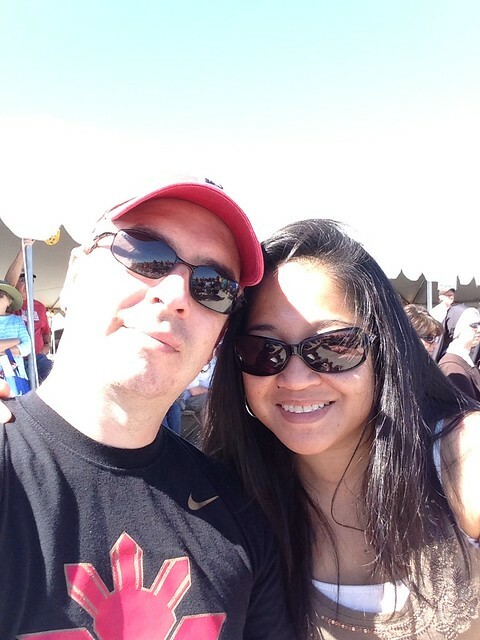 Posted on September 28, 2013 by Ching under Food and Drink, Travel. This was my breakfast on my last day in Minneapolis: Minnesota Eggs Benedict, Hashbrowns, Bacon, and Fruit. I thought they were just going to give me a cup of fruit on the side. 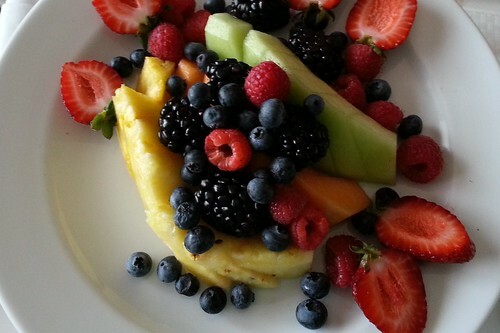 Instead I got this amazing fruit plate. The fruits were delicious! 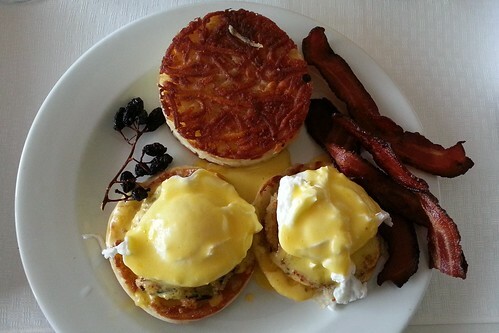 The Minnesota Eggs Benedict is an eggs benedict with walleye cakes. Walleye cakes are like crab cakes, except instead of crab meat they use walleye. Apparently walleyes are abundant in Minnesota because they serve it everywhere. Some sort of walleye dish will be listed on the menu no matter where you go. At least that was my experience. I think the only place I didn’t see it was at the sushi place. With the exception of the mixup with breakfast delivery my breakfast was fantastic. The Depot did a wonderful job. I just wish it didn’t cost so much. If room service wasn’t so expensive, I probably would have had breakfast delivered to my room every morning. LOL. Nami Sushi is a sushi joint that is conveniently located near our hotel so we ended up having dinner there on Thursday night. The decor is modern and the atmosphere is subdued. Then again, we were there on a week night and we just missed happy hour. I’m sure the place is more crowded and lively on the weekends. 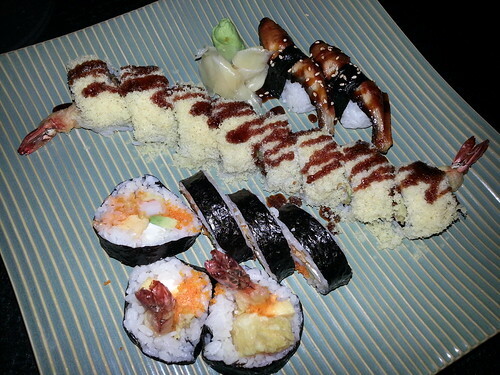 The sushi at Nami is pretty good, though not as good as my favorite sushi place here in Wichita. The restaurant itself is fancier, though. But everything is fancier in Minneapolis it seems. I’d probably bring Brian here if we ever find ourselves in the hip Warehouse District area. 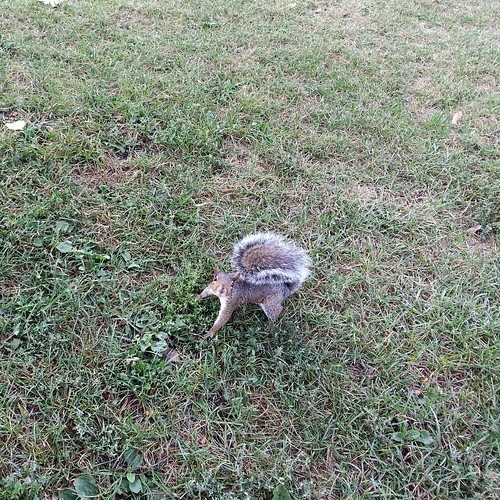 Posted on September 27, 2013 by Ching under Travel. 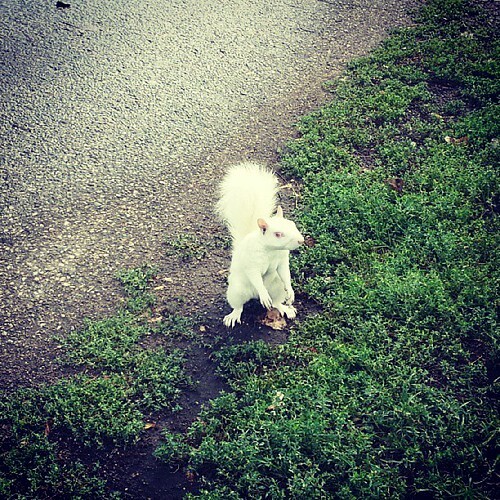 Minneapolis definitely has the friendliest and most photogenic squirrels. They’re not afraid of people at all. 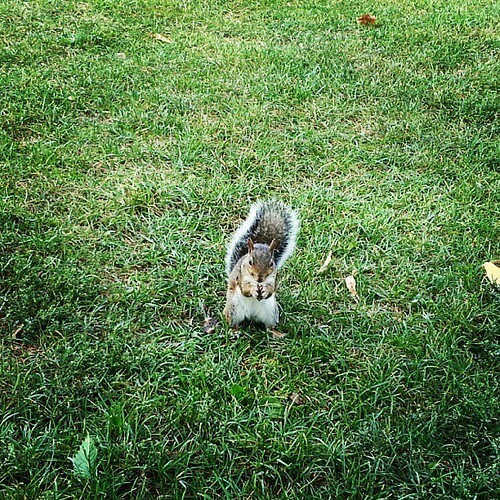 These guys pretty much walked up to us and posed for photos. This one is a little creepy. 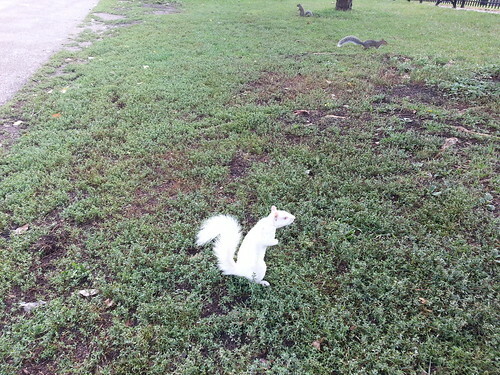 I’d never seen an albino squirrel before. This guy is my first.